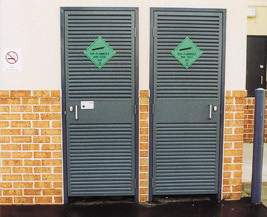 The Lietzke Heavy Duty Louvre Door, is manufactured to provide ventilation in harsh conditions or abusive environments. The door is manufactured from a 38mm x 38mm x 1.6mm Galvanised Square Hollow Section (SHS) steel sub frame with a mid-rail formed using 1.6mm Galvabond sheet steel. The standard ‘Chevron’ louvre blades (Optimal ‘Z’ shaped blades are available) are manufactured from 1.2mm Galvabond sheet steel. All sub frame and mid-rail joints are fully welded and dressed to a clean smooth finish. The louvre blades are fixed using sealed rivets to prevent the ingress of moisture into the sub frame. Most locking devices and hardware can be factory fitted to the door. 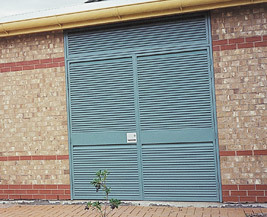 Heavy Duty Louvre Doors are also available in Double Door configuration. Any application requiring airflow for supply, exhaust or return air applications such as transformer sub-stations and plant rooms. Finishes include Etch Prime but may be left unprimed or finished in factory applied durable polyester powder coat. Three (3) 100mm × 75mm × 2.5mm Satin Chrome Plated for standard door size. Most locking devices and hardware can be factory fitted. For Architectural applications use a BW Style frame to suit the required door and wall thickness. Door shall be a Lietzke Heavy Duty Steel Louvre door comprising a galvanised steel SHS Sub Frame with 1.2mm Galvabond Chevron (or Z Shaped)* Louvre Blades finished in Zinc Rich Prime (or Powdercoated)* and pre hung in 1.4mm Zincanneal Frame with Hardware pre fitted.